Google Maps now has a great route planning feature called “avoid highways”. This produces routes that don’t go on to motorways and some trunk routes, such as the Edinburgh City Bypass, where cyclists are not allowed. roads that cyclists are not allowed on. However it is a step in the right direction for route planning for more experienced cyclists who are happy to cycle on main roads rather than the quieter National Cycle Routes. It also still routes cyclists on some roads that cyclists are banned from using, such as the West Approach Road in Edinburgh. See example map that shows this problem. Another problem is where the route planner takes you a much longer way than you would expect. For example Edinburgh to Dundee avoiding highways takes you via the Kincardine Bridge, this is fine if there is high winds and the Forth Road Bridge is closed to high sided vehicles and pedestrians/cyclists. However that is significantly longer than going via the Forth Road Bridge. 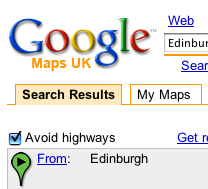 This entry was posted in Cycling, Google, Maps on May 26, 2007 by smsm1986. I found the new “Drag & drop the blue line to customize your route” function quite useful in combination with the “Avoid Highways” function when planning cycle routes. An “include cycle lanes”, and estimated journey times based on cycling speeds would be amazing. I believe Tom Tom Navigator and other GPS software does this. If your looking for a real cycling map (albeit partially complete) take a look at http://www.gravitystorm.co.uk/osm/. Your more than welcome to come and help complete the map. That will give you cycle network in the UK. Another site that I use is MapMyRide which is geared towards cyclists.